TWO Rockingham residents will have their artwork displayed on Christmas cards to raise money for Activ. Activ ran a competition where customers submitted a piece of artwork showcasing what Christmas meant to them. Three winners were selected to have their artwork produced in Christmas Cards. These Christmas Cards will be used to encourage donations throughout the Christmas period, where any donation of $32 or more will be rewarded with a 10-pack of mixed cards. Winner Tammy Buesnel (29) has cerebral palsy. She submitted her piece Starry Night as part of a group entry from Activ’s People, Skills and Community centre in Rockingham. “Tammy is non-verbal and can be found forever sitting colouring in her books”, her carer Mandy said. Candice Raphael (33) came in third place, bringing her unique dotted artwork style to the traditional Christmas Pudding. Activ chief executive Danielle Newport was thrilled with the entries. “The Christmas Card entries we received this year have demonstrated that many of our customers are passionate artists, and welcome the opportunity to showcase their creativity,” she said. 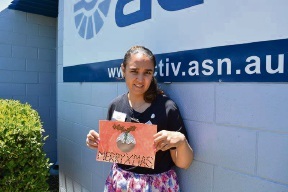 To donate and receive a pack of Christmas Cards, visit www.activ.asn.au.